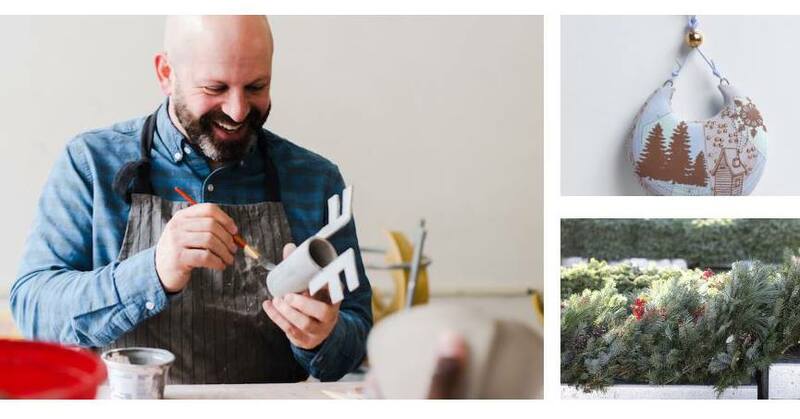 Visit The Clay Studio for your holiday shopping needs and join us for our fourth annual Hand Crafted Holidays – a festive day of tastings, demonstrations, shop discounts, and hands-on activities intended to spark creative ideas for holiday decorating, gifting, and entertaining. Drop-in activities this year includes clay ornament making, a pastry decorating demo, gallery talks, and signature cocktails. Free and open to the public! This is also a great opportunity to shop the first annual Old City Holiday Market just outside of gallery and the visit the festive annual Deck The Alley event! This market features curated giftables from local shops including 36 Craven, Philly Socks, Spa Terme Di Aroma, and the The Center for Art in Wood. Along with trees and greenery from Petit Jardin en Ville and delicious treats from Fork, Fezziwig's Sweet Shoppe, and Royal Boucherie. In-store purchases receive a 10% discount throughout the day. For every purchase you make your name will be entered to win a $100 gift certificate. 11:00am: Coffee, Donuts & a Demo! Start the day off with coffee and delicious gluten-free donuts from Okie Dokie Donuts and coffee from Cafe Ole - Old City. Enjoy a pastry glazing demonstration by chef and owner, Carol Ha. Get hands-on with our talented teaching artists for a fun clay ornament-making activity inspired by the Hand Crafted Holidays Ornament Market on view. After the event, your ornaments will be fired in our kilns and available to pick up a week. Join author, illustrator, artist Alex Stadler discuss how he uses various media, including his recent rediscovery of clay, to express his artistic vision. View examples of his paintings, books, illustrations, and ceramic art. Alex will be painting them in the Shop and pre-orders taken that day to be ready by December 15th. Try a sample of a holiday inspired cocktails featuring Powers Whiskey.